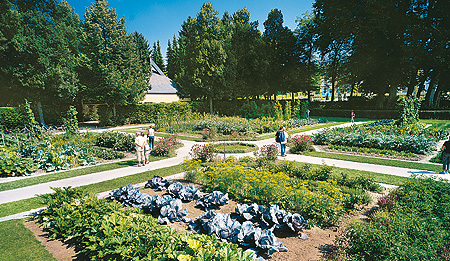 From 1702 a flower garden was created which formed roughly a square around the "Summer Residence", the present palace. It was entered from the Dorfstrasse and on this side was designed around the main entrance and drive as the front garden of the palace. On the north side was a kitchen garden with a carp pond and on the south side a long garden full of trees, where pheasants and deer were kept. In 1702/1703, under Prince-Bishop Johann Philipp von Greiffenclau (reigned 1699-1719), the pheasantry was transformed into a show garden. The balustrades, supporting and surrounding walls, main paths and lakes that are still in existence today date from this period. The first figure cycles, by Johann Wolfgang van der Auwera (1708-1756), were produced under Carl Philipp von Greiffenclau (1749-1754). 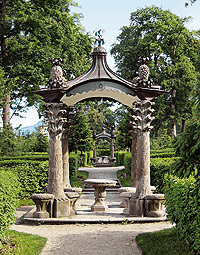 The present design of the garden, with all its variety, was begun in 1763 by Adam Friedrich von Seinsheim (1755-1779). He commissioned further figure cycles from the "most important German garden sculptor of the time", Ferdinand Tietz (1708-1777), who completed the task in just a few years between 1765 and 1768. The final cycle was created by Johann Peter Alexander Wagner (1730-1809) from 1772 to 1780. 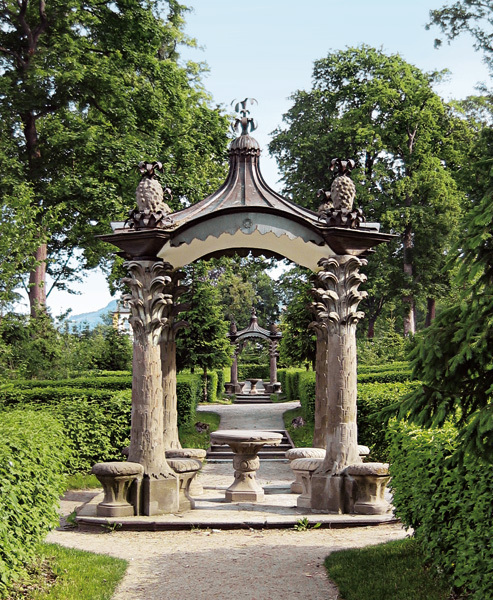 After the death of Seinsheim, the importance of the garden was not fully recognized until the 1950s and 60s, when it was restored in its rococo form of 1779. This garden probably has the greatest variety of content and symbolic meaning of any in South Germany. The cosmological programme portrays the Prince-Bishop's palace as the symbol of heaven. 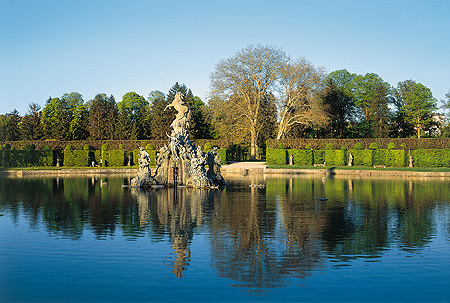 The large, naturally growing trees by the palace, the large and the small lake and the circular bed were added in the 19th century. At the palace an exhibition on the history of the court garden is on display.